We design and develop products that delight your customers and grows your business. We're a team of software engineers, product designers and strategists with a passion to create digital products that make people happy and businesses grow. From strategy to product launch and beyond, we work in strategic partnerships with companies that take their digital future seriously. We provide both back-end and front-end development. Our teams build web applications powered by bulletproof code, with stunning interfaces based on responsive web design..
We provide both back-end and front-end development. Our teams build web applications powered by bulletproof code, with stunning interfaces based on responsive web design. Smartphones, tablets, wearables - follow your users where they are with carefully crafted mobile apps. Reach customers via Android, iOS, or cross-platform solutions. At DevGap we offer consistent quality that extends to every tier of application development. To create quality user interfaces, we focus on individuals rather than abstract “users” in our design. Our goals is to create products that delight customers. Bring an idea to life through an agile development process. At the end of this three-week MVP session, you will have a fully functioning product to begin customer acquisition and fundraising. Top-notch e-commerce development. Our major focus is delivering a ‘WOW’ customer experience. Our team acts on well-tested development process to yield the best dividend through our strategic planning. For this project we created UX/UI improments and also made huge improvements in their onboarding process. We worked closely with the founder Neil Patel. 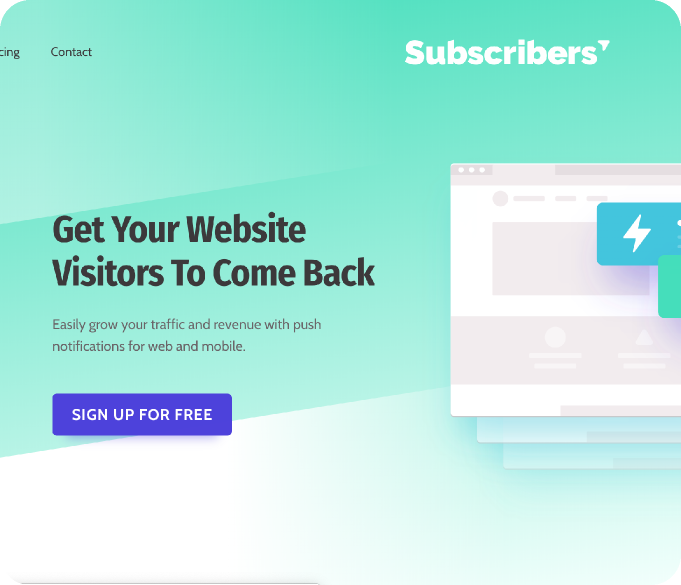 Subscribers.com will help you grow with push notifications. For this project we worked with partner company FillGap Theme. Scope of work: Wordpress development. Wordpress extension development, brand design and frontend-development. UX/UI and Magento 2 migration. One of the the biggest challenge of this project was developing a stable Magento 2 Toapix API extension. UX/UI & Custom Magento Development with Taopix API development. Instant Celebration proves a design tool to create sticker frames in 3D. DevGap was one of the fastest agencies I have ever worked with. Koen and his team overcommunicates and is always on time. I’m very pleased with the work and impressed by the features de­veloped. I trust that whenever a challenge might occur, DevGap’s team will do their upper best to find the perfect solution. It was evident from the start that DevGap is passionate about making great sites. They helped us on a complex Magento integration and we were impressed by their attention to detail, their quick response time and their deep talent pool.It was truly a collaborative project, and our in-house team felt as if they were right there beside them, striving for perfection and for the best outcome possible. There is a pride of craftsmanship in DevGap that reflects our own and give us no doubt that we can count on them for the years ahead. In 2018 we hired DevGap to build our Magento Multistore for www.InstantCelebration.com. Functionality and UX was done very professional and our main integration with Toapix software was done in the same way; seamlessly.We are very happy thus far. An ongoing business relation into the future. Go and order your Instax sticker frames on www.InstantCelebration.com and experience the result. We contracted with the DevGap in 2018 to build/configure and support code development for our Magento multistore for the Picture Playground Group. Phase I of the project was delivered on time & in line with budget. We are now working as partners developing our on-line vison & an experience to stun the customers & competition. I would recommend DevGap for any company wanting a Magento partner! We worked with DevGap on several projects. All new sites performed well and are successfully generating and retaining a greater number of leads. DevGap knows how to build a valuable long-term partnership through outstanding communication, accessibility, and marketing expertise. How did you hear about DevGap?